The award-winning SETsquared Partnership is to launch a consultation with its growing number of scale-up company members and recent members to help understand and develop better support for them in the South of England region where the university enterprise Partnership has operated since 2002. The average membership period of a company in SETsquared is around 30 months and so it’s not surprising that many of our current and recent member companies are so-called scale-ups – a scale-up is defined by having more than 10 employees and sales growth of more than 20% per year for at least three years. 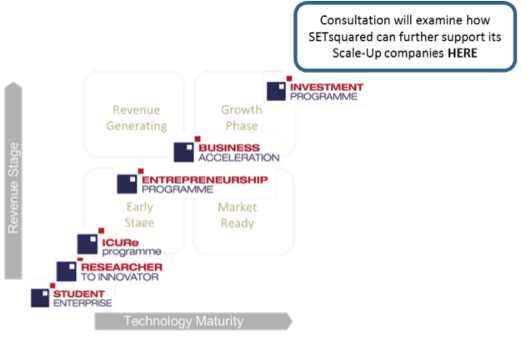 “SETsquared has an established portfolio of award-winning programmes that support early stage business creation and start-ups from universities and the private sector. It also offers access to investors and corporate innovation teams. This Consultation aims to help SETsquared better understand what drives scale-up companies and how we can develop our assets and capabilities to support their continued ambition for growth,” said SETsquared’s Innovation Director, Simon Bond. Thought-leaders in the sector, the Scale Up Institute, has identified the following key areas for support – increased collaboration, improvement in skills, leadership development, assistance with international expansion, championing of success stories. SETsquared’s Consultation will examine how its current and recent members have benefited from support in these key areas during their start-up phase and how they could continue to benefit from support as they scale-up.